We did some painting (Behr Castle Path), changed out the floors (to be shared later), and found that cool GE 2.0 Spacesaver Mounted Microwave on Craigslist for…$50!!! I love Craigslist. However, the biggest change of course has been our cabinets. 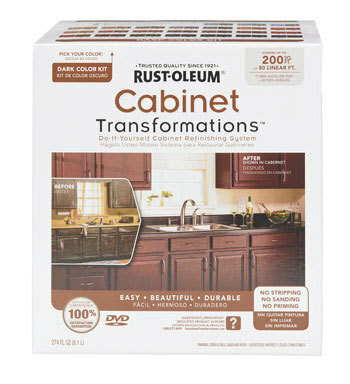 No, we did not purchase new ones, but we did purchase this cool kit from The Home Depot called Rust-oleum Cabinet Transformations . I really liked the kit. Rust-oleum offers two different kits (light & dark) which offers over 70 different color options. We opted for the dark kit in Espresso. For $75, it will suffice until we can one day pay $10,000+ to get a custom kitchen built. 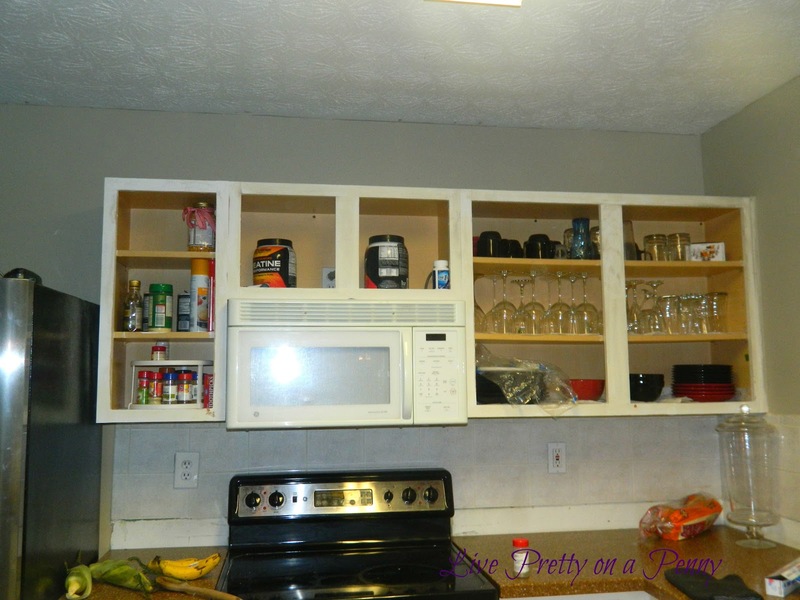 Oh, and since we don’t consider this to be our “forever home,” then that made it even better:) So for those of you out there living with dated cabinets, or ones that you just can’t stand, well I recommend giving it a try. The kit comes with pretty much everything you will need to complete your transformation. It took us a few weekends to complete since we have to fit home projects in between work, but we survived. It even comes with a little how-to video. Here is how we did it. First, you will need to setup a work station somewhere, preferably either a garage or somewhere you will not need to use for the time being. Because the kit does not emit strong odors, we set ours up in an empty room downstairs. Next, you want to remove all of your doors, doors, cabinet hardware, and hinges. 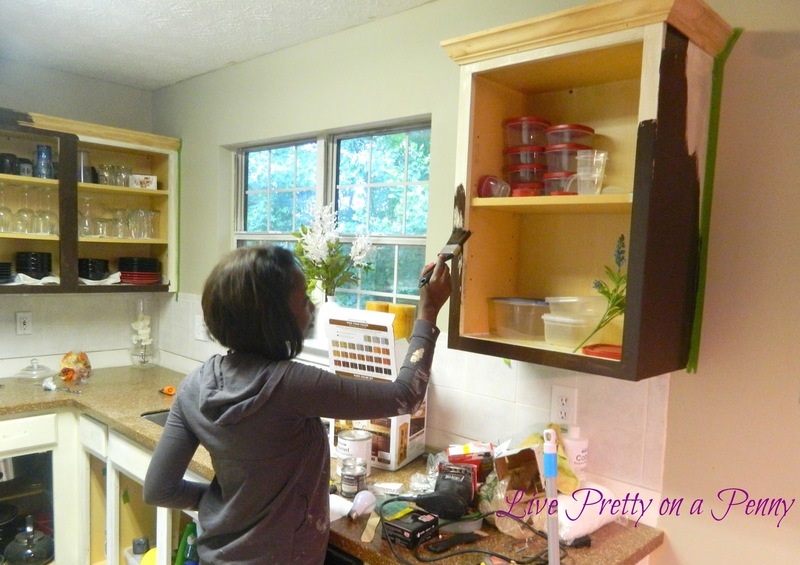 Using painters table, number the inside of each drawer and cabinet, and assign a sandwich baggie for each corresponding cabinet hardware and hinge. 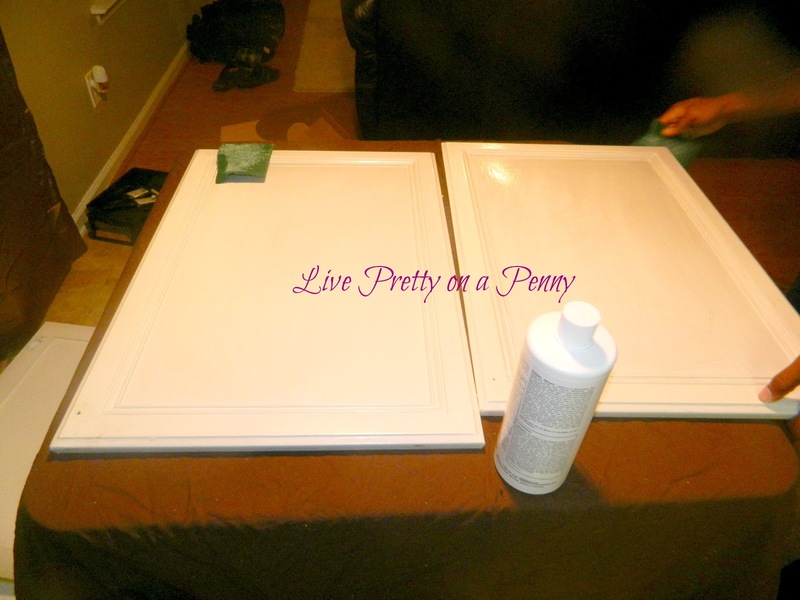 For example when you remove the first door, then assign then write #1 on the on painters tape, stick it inside of the cabinet, remove the door hardware and hinges, and place in a sandwich bag with the #1 on it as well, using painters tape. This helps so that when you are putting the doors back on, you have all of the correct hinges and hardware to put back. 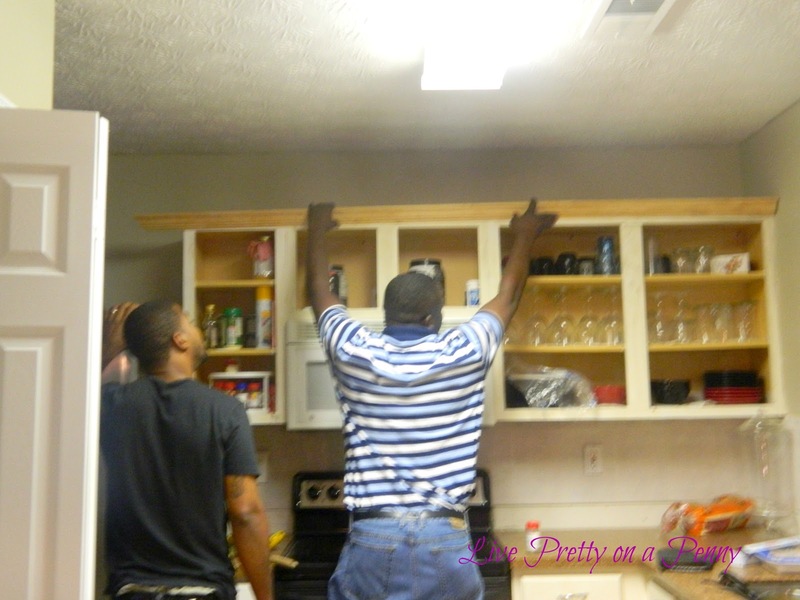 While we were in the process, we decided to go ahead and add some unfinished molding to the top of the cabinets. So my husband and one of his friends added it. I believe it cost about $14 or so for the molding, and seemed pretty easy to put up. I didn’t help so I don’t have a tutorial, sorry. Once that was done, we used the liquid sander that comes with the kit to remove the old finish from the cabinets. The good thing about this is that you don’t have to remove all of the old finish (paint or varnish), but just enough to rough up the surface and remove any signs of slickness so that the system has something to stick to when applied. The kit comes with a scrubber pad to be used with the liquid sander. After you “sand” the cabinets, drawers, and cabinet frames, then wipe down and remove the residue of the liquid sander using a damp cloth. Next, it is time to apply the bond coat. We started with the cabinet frames, then moved to the doors and drawers. Although Rust-oleum did not specify, I strongly recommend that the bond coat be applied with a high quality paint brush. They do specify that the bond coat not be applied with a roller brush or sponge. 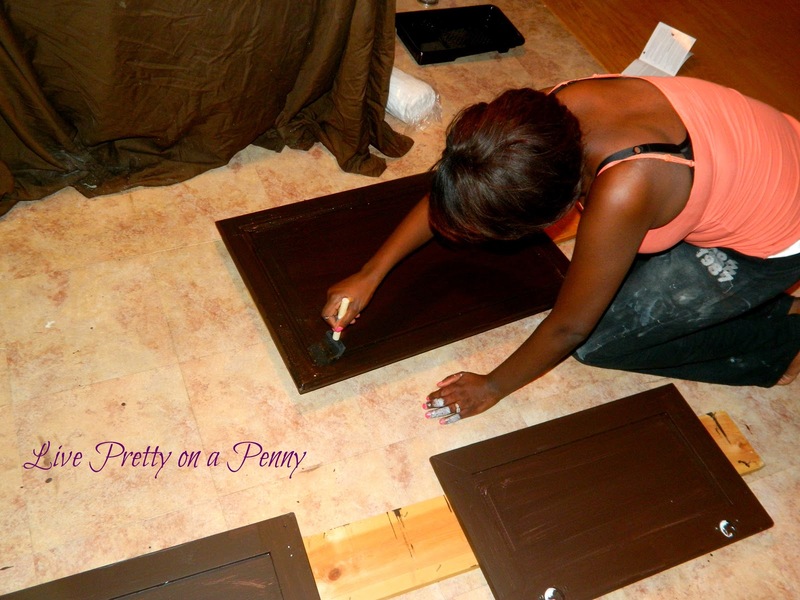 There is an outlined dry time in between each coat, so make sure to follow along with the instructions. Two coats should be applied. After the second coat has dried, it is time to apply the decorative glaze. This step is optional, but I recommend if you want to create more definition and “enhance” the appearance of wood grain. The kit comes with clean wipe cloths to remove excess glaze. 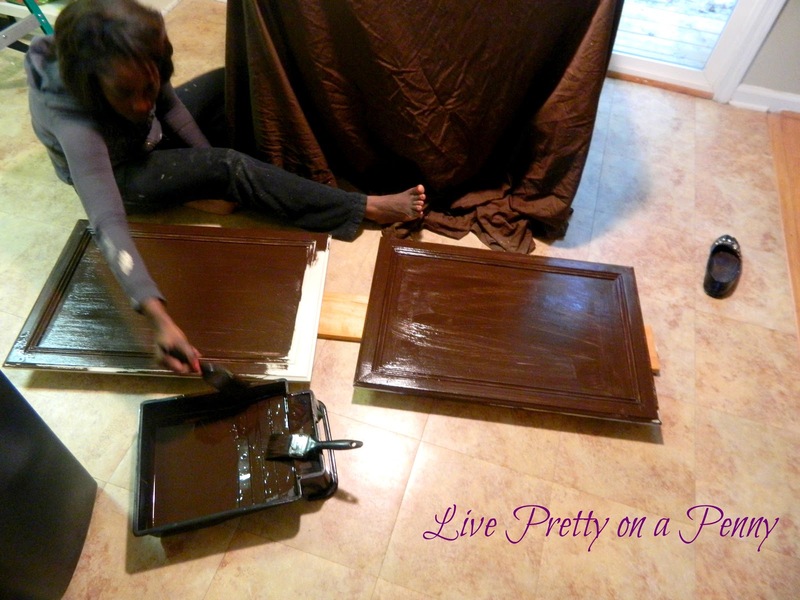 Once the glaze dries, allow 24 hours before re-applying cabinets. To create even more of an update, we decided to change the cabinet hardware, which I also recommend. We ordered ours online from InterKnobs. They are the Liberty Hardware, 96/135mm Steel Bar Pull Stainless Look Finish (Satin Nickel), and cost $1.32 each. That’s it! 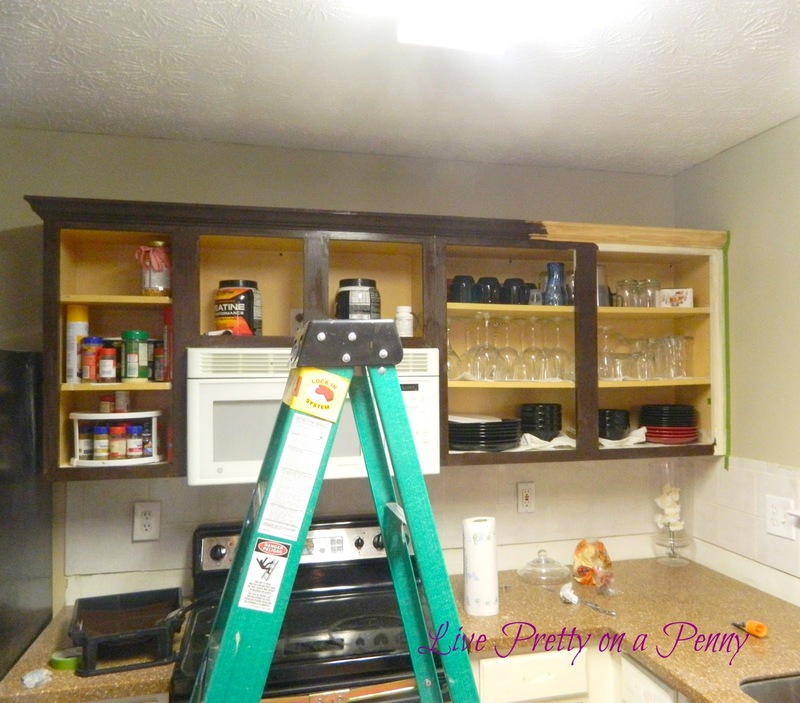 Cabinets and drawers can be re-applied. 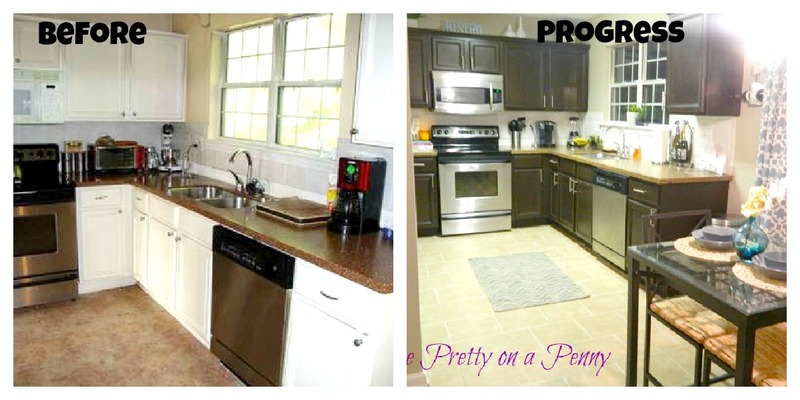 Once again here is a good side by side of our kitchen before and after progress, following our Rust-oleum Cabinet Transformation. 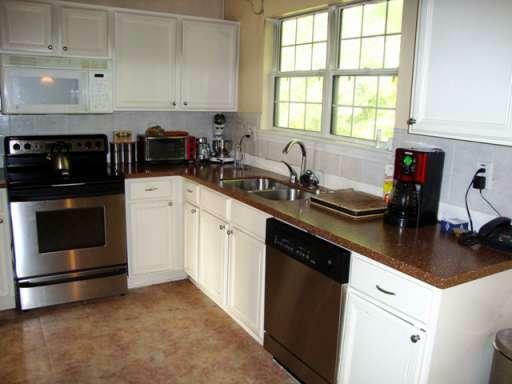 Have you made any good kitchen updates lately? I would love to hear from you! Thanks Mary! 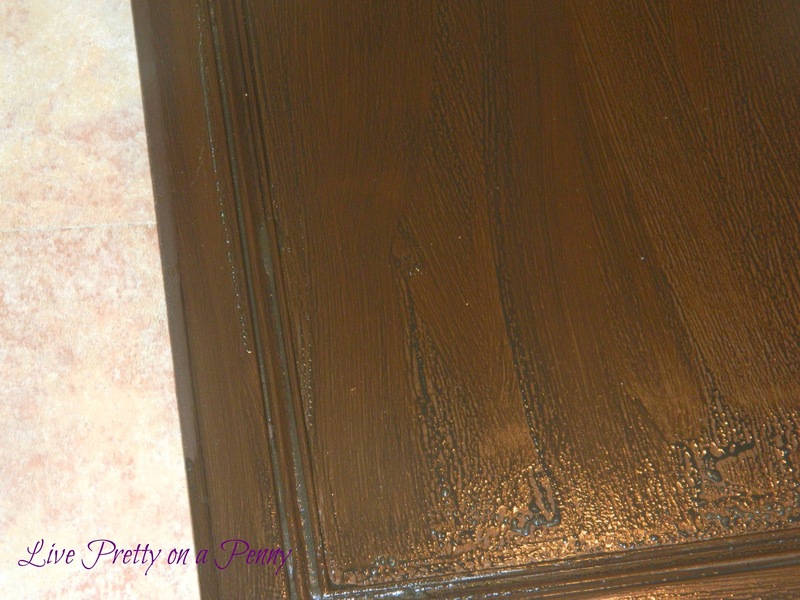 I would have loved to stain my cabinets. But since they were already painted, I had to go with the bonding system. But I like them for now. Until I can afford my dream kitchen:) Thanks for stopping by. The dark cabinets are so classy. Great job – the whole project looks professionally done! Thanks Kelly! We are in love with the change. WOW – what a difference! It looks fantastic. I love the darker cabinets. They look so rich. Looks awesome!!!!! I've seen this products commercial and gad to know someone has used it. Hi there! I found your blog through Brandi. Your cabinets look good. 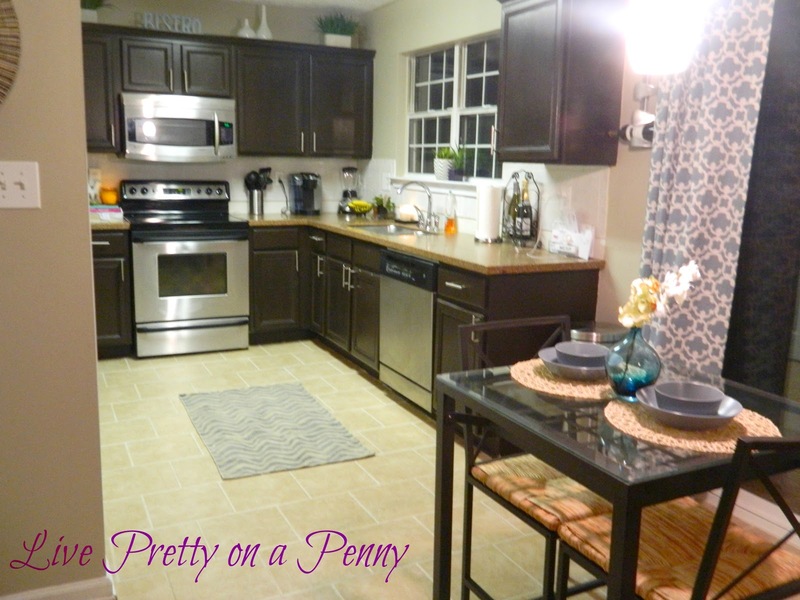 I also re did my kitchen cabinets with Rustoleum cabinet transformations. Glad I found your blog. Can't wait to see your backsplash. 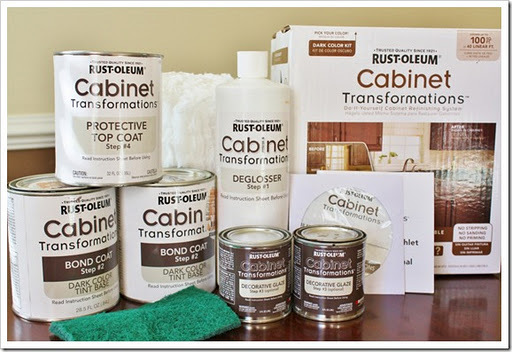 Can this kit be used on laminate cabinets?